February. The month of luuurve. Now remember what I said on Friday? 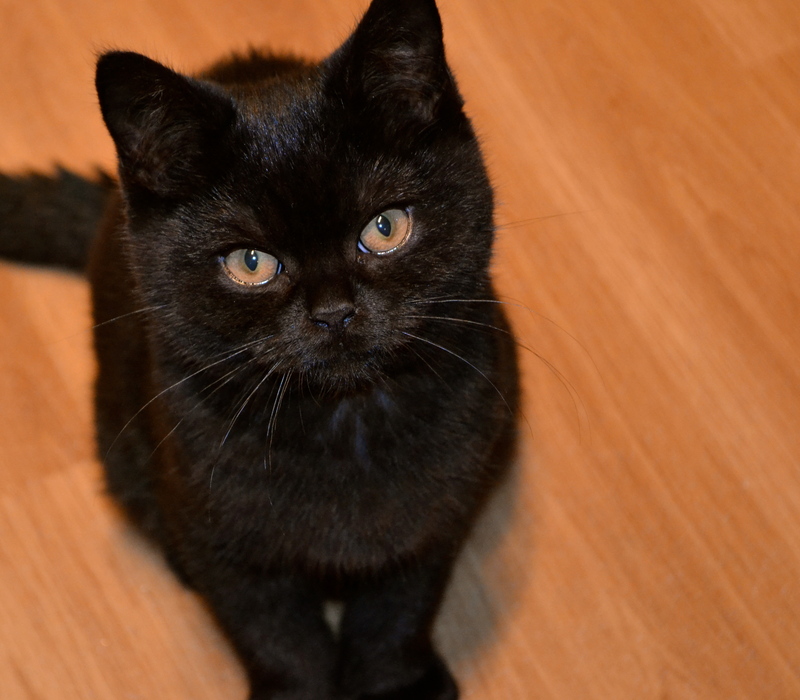 Recently porridge and I have been very much into each other. So much so that, like any other true love, I can’t get through the day without it. Honestly. I simply can’t get my brain moving without it. No porridge = no Py. 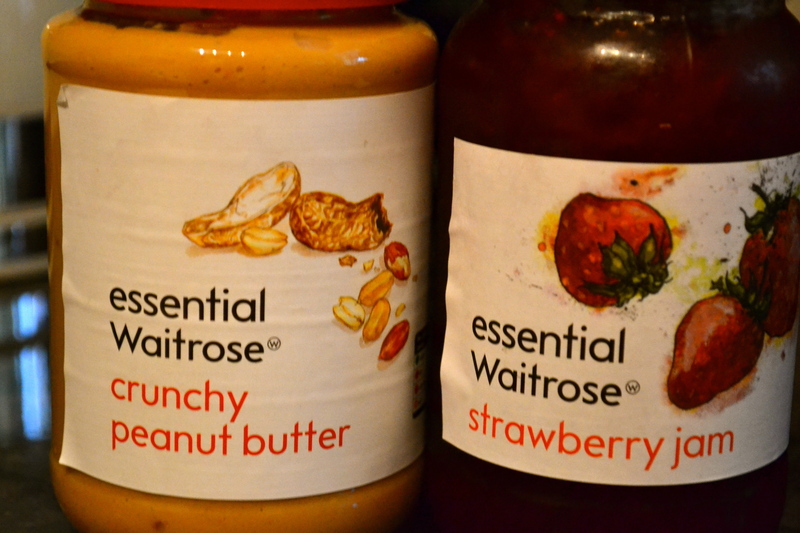 This level of fever pitch has been reached by my discovery of peanut butter and jam porridge. 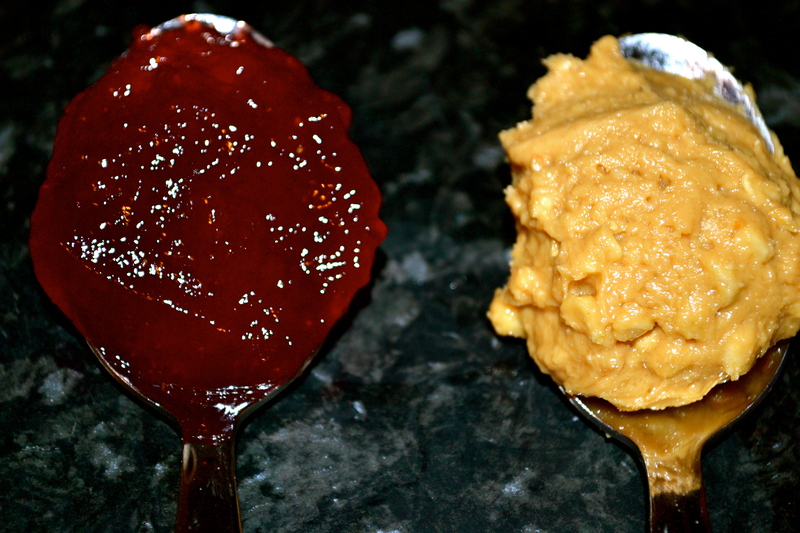 A spoonful of peanut butter stirred through the gooey oats, with a dollop of strawberry jam on top. Morning glory. This recipe calls for ‘cups’. This is not meant in the american sense, but rather in the sense of proportion. For my ‘cup’ I use a very small chinese tea cup. 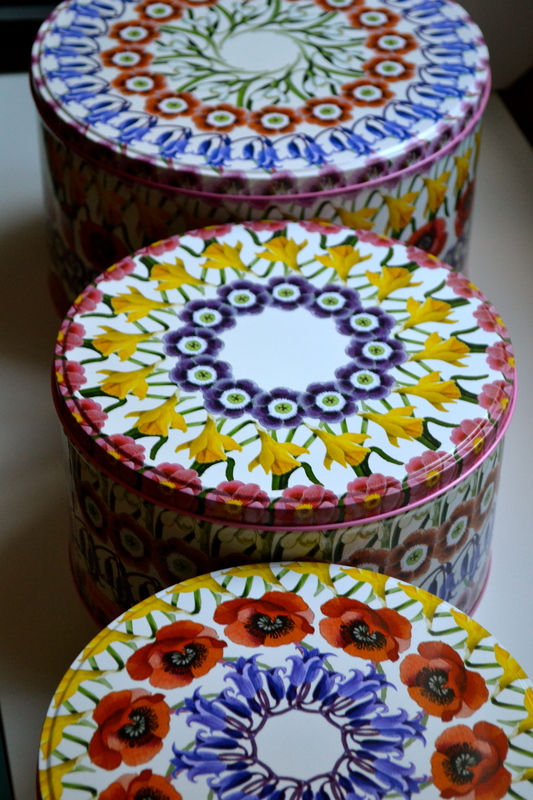 As for spoons, that’s up to you; feeling healthy use a teaspoon, feeling frivolous use a tablespoon. 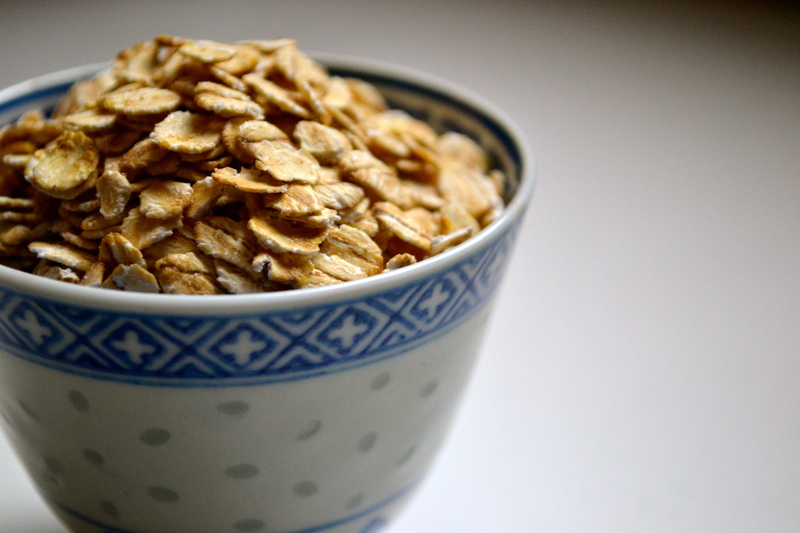 When it comes to oats, it really is a case of the bigger the better. I am not interested in oat dust, only proper jumbo oats. Obviously this is not the only way to eat your porridge. If you fancy something else (I love grated apple and cinnamon too), just follow the basic recipe (oats, water, milk, sugar and salt) and add your own flavourings. Place the oats, liquids, salt and sugar in a pan, and place over a medium heat. Stir occasionally, and simply wait for the oats to soak up the liquid and become gooey, rather than watery. The time this takes depends upon the oats used. Once you reach the gooey stage, add your peanut butter and stir through. 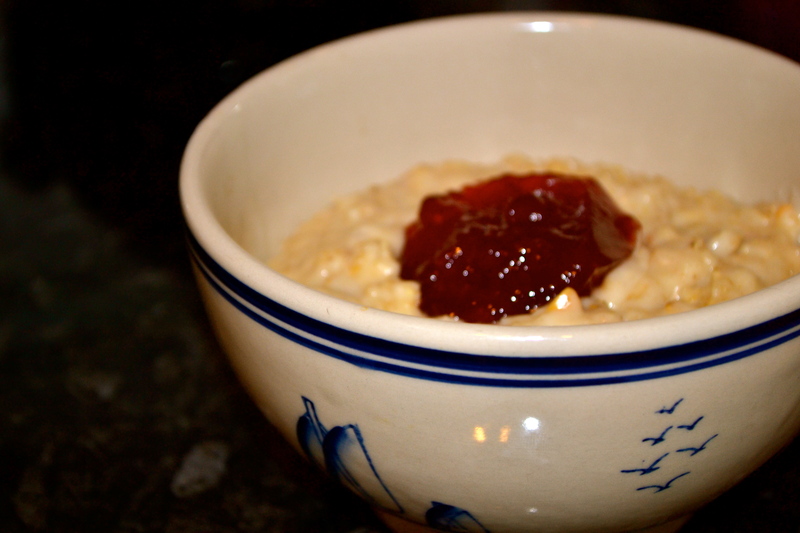 Dollop the porridge into your bowl, and dollop the jam on top. 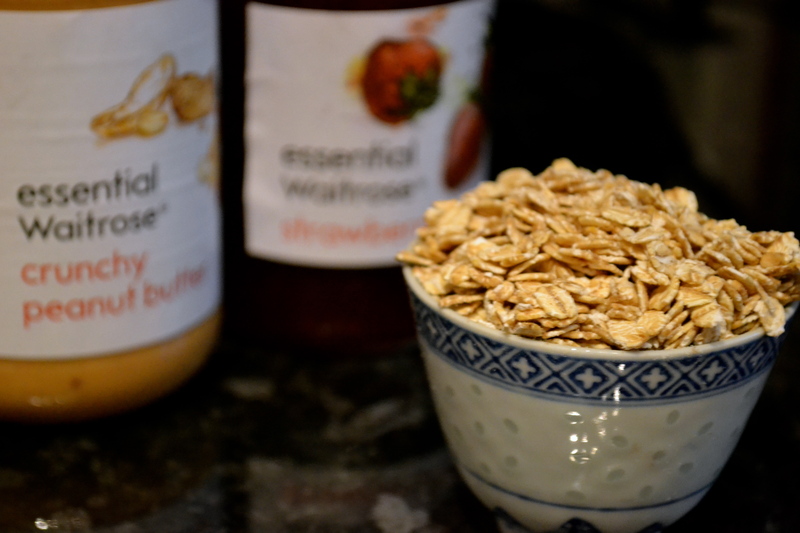 What are your favourite ways with porridge? And what are you just loving at the moment? What’s that they say about the best plans? Last week, I introduced a little series of posts pulling together my weekly food photos on instagram (@pyandplate, check it!). However, this week I have been far too greedy, chowing down on my grub before I have any chance of photographing it. What can I say, my mouth moves faster than my hands. 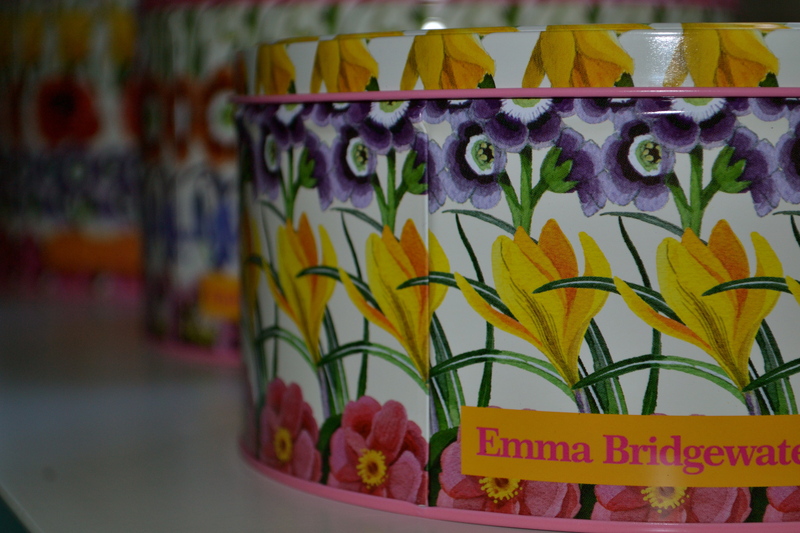 So, instead of photos this week, I’m going to give you a quick rundown of my favourite things this week. 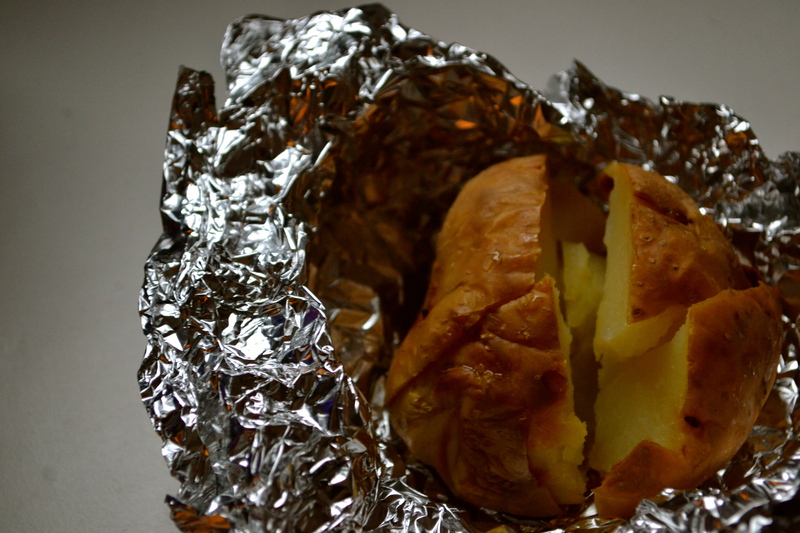 Finding a bag of big potatoes lurking at the back of my cupboard I decided to bake the whole lot of them and then leave them in the fridge for a quick but substantial lunch. This week I have them heated and stuffed with all sorts of things, from cheese to coleslaw, with humous and tomatoes proving to be my favourite. Lovely. This cookbook (which I reviewed here) has proved invaluable through this busy week. 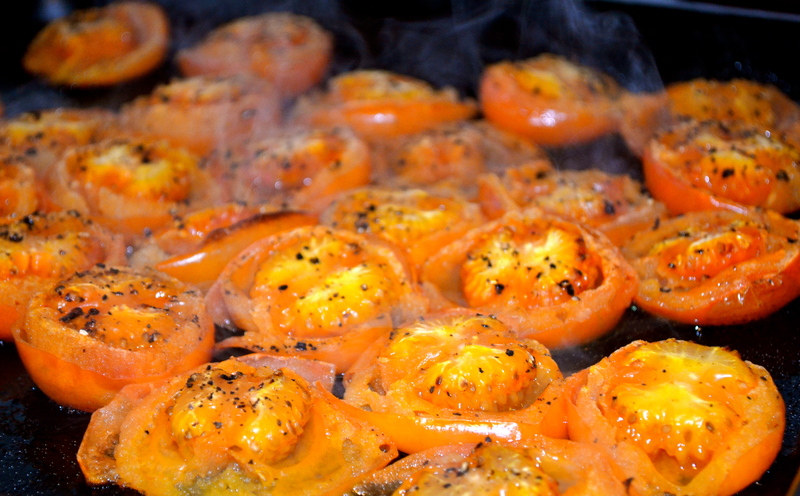 Tomatoes stuffed with rice and sweetcorn pudding have particularly hit the spot. Having given up my expensive coffee addiction in order to pay for my kitten’s fancy cat food, I have really missed my ‘treat’ drink (as opposed to my regular green or mint tea). 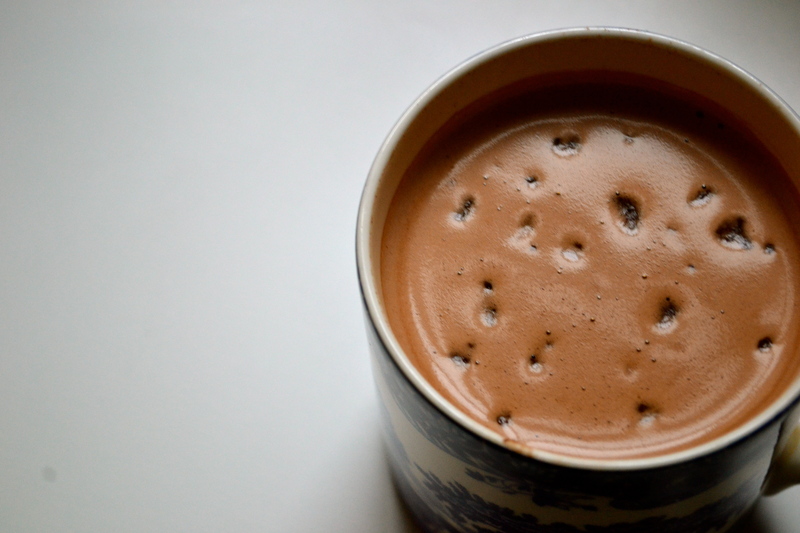 This week that spot has been filled by hot chocolate. My current fave is Options ‘Mint Madness’, as it is low in fat, quick to make, and doesn’t rely on me having milk in my fridge. 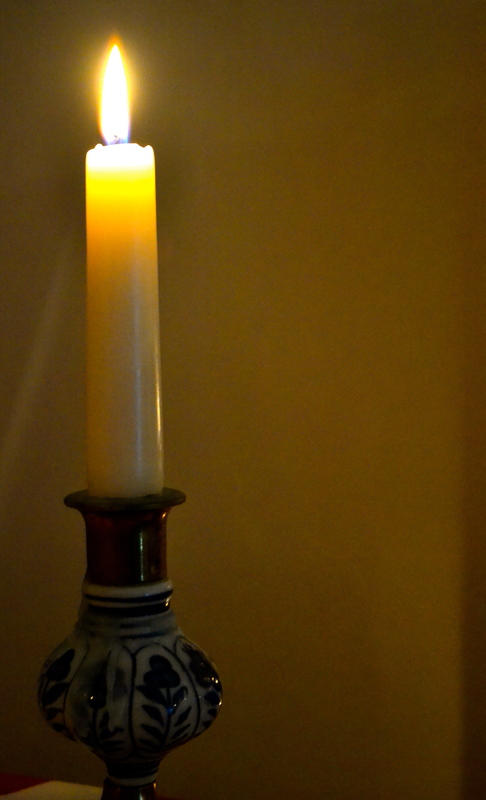 My Py and I have our dinner by candlelight every night, whether we are having a feast or a bowl of soup. This week I have stopped taking this for granted, and have really appreciated the beautiful romance of it all. And the flattering effect of the light, obvs. What have you guys been loving this week? And what are you looking forward to next week? Can I just dive in? I like soup. No, I love soup. However, sometimes I need something more. That is where chowder comes in. 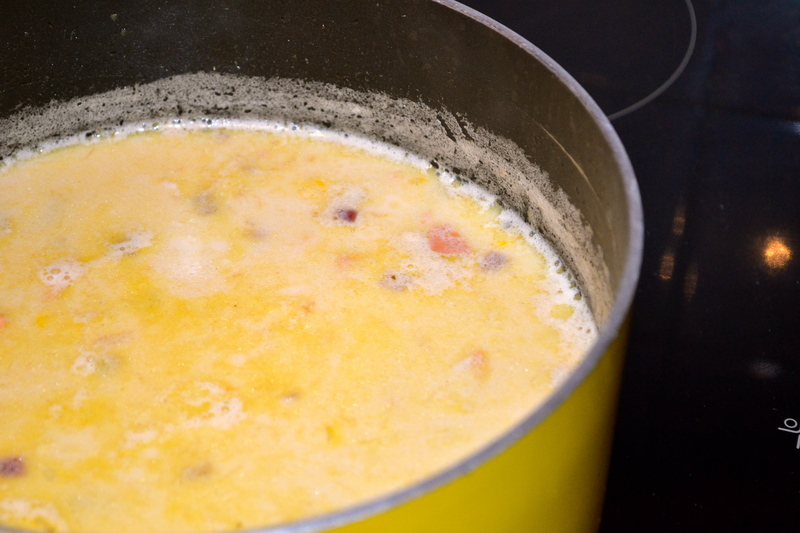 Richer, creamier and more filling, Chowder ticks all the boxes for a cold, drab February night. Especially when you have already had soup for lunch. 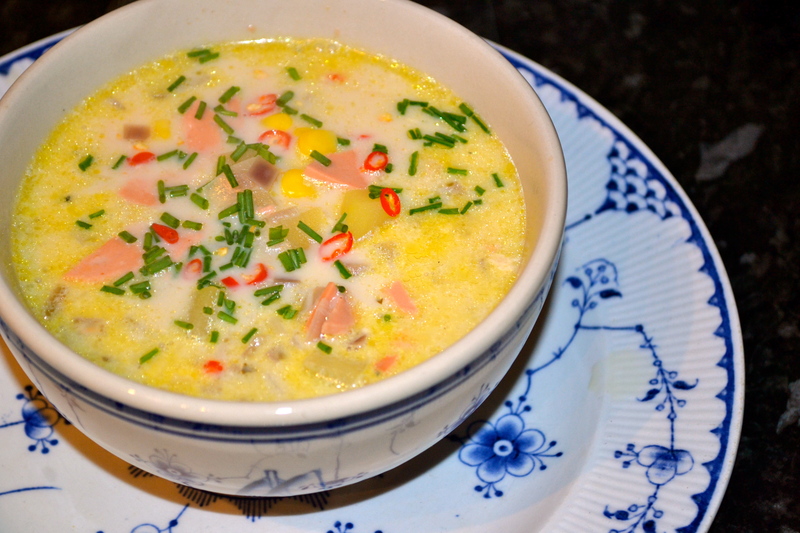 The sweetness of the sweetcorn, the saltiness of the stock, the creaminess of the milk, and the smokiness of the bacon all combine to give a wonderfully complex yet extremely comforting flavour. Plus this meal is yellow. Who is not going to feel a warm glow at that? In a big pan, gently fry the bacon, potato and onion in some oil; cook until the onion is soft (don’t worry about the potato being soft at this point). 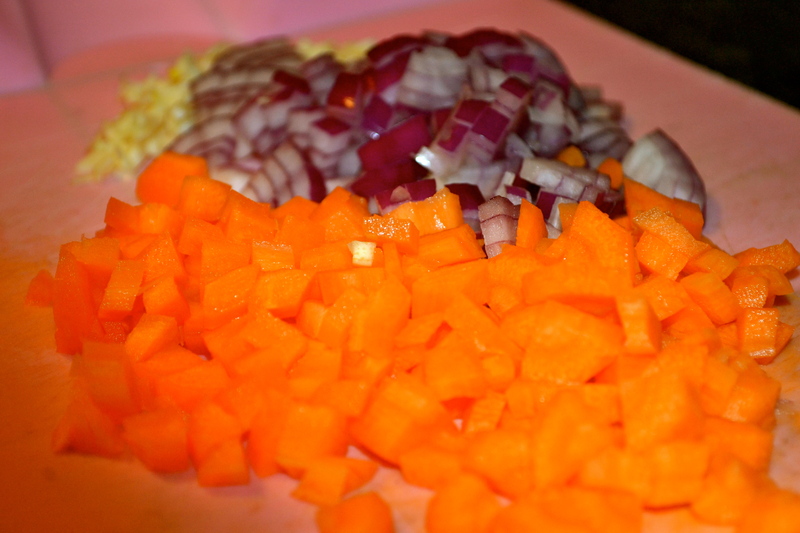 Add the stock and milk, and bring to a simmer; leave simmering until the potato in soft. 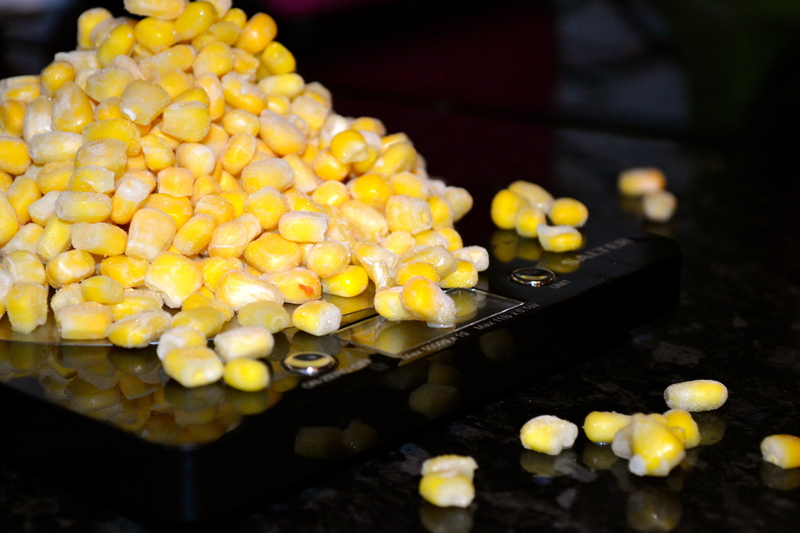 Add the sweetcorn to the pan, and cook until done. 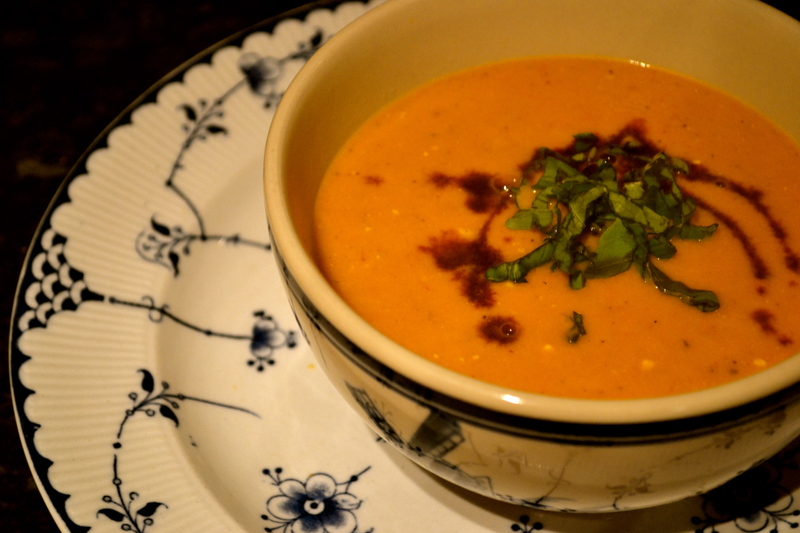 Serve in big bowls and top with the chives and/or chillies. If you are feeling especially hungry add some crusty bread or maybe even a quesadilla. Please Mum, can I try it? Do you like to chow down on a good ol’ chowder? Or is there no replacement for your super soup? Now, I don’t want to blow my own trumpet, but I have discovered the cure for a hangover. Well, maybe discovered is the wrong word. And maybe ‘cure’ is a little dramatic. But otherwise it is true. ‘So what is this miracle cure?’ I hear you cry. Well, it is Heuvos a la Mexicana. To the uninitiated, that means Eggs the Mexican Way. To the even less initiated, that means scrambled eggs with spring onion, chili, tomato and tortillas. Oh yes. The perfect balance of stodgy (thanks tortillas! 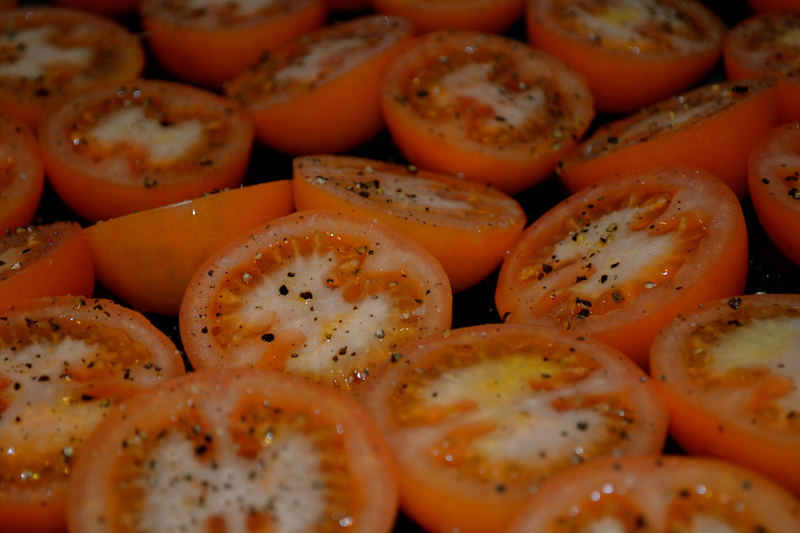 ), healthy (hey tomatoes, with all your vitamin C! ), and spicy (kick my arse out of bed, chili! 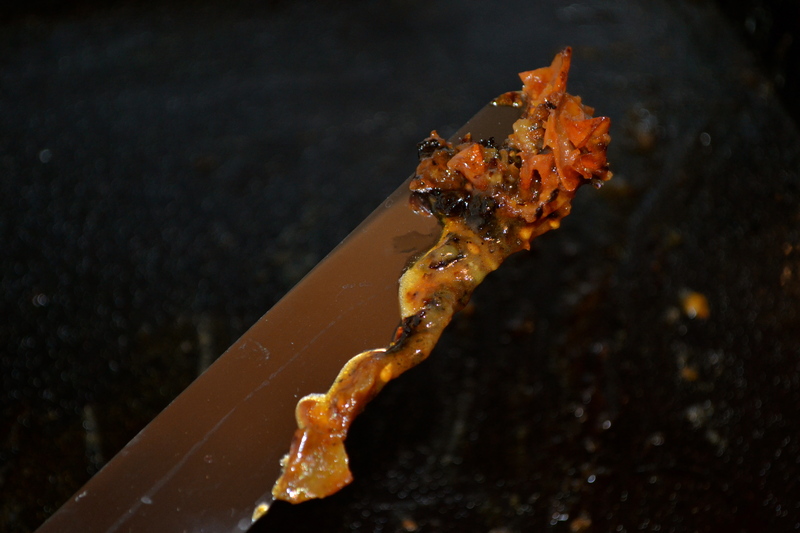 ), this dish is like a band-aide to the self-inflicted sore soul. As for a recipe, I follow Nigella Lawson on this one, as she doesn’t even call for a knife; fearing a sharp implement with a head like cotton wool and the reaction times of a turtle, I simply chop everything with scissors. Even the tomatoes. He ain’t pretty, he’s my saviour. Let me know if this cures you. Any other pieces of advice that I should be following? Now, prior to my blog, I was in the cave. Not even in the Plato way. Quite literally. I was in the cave by way of my complete lack of technical understanding and ability. For instance, in my first year of uni, I typed with one finger. The world of technology was a complete and utter mystery to me. And now, although I am perhaps the only person in the world without a FaceBook account (at least the only 23 year old), I am starting to embrace this new world. Not only through this blog, but also through the likes of twitter and Instagram. Now, instagram is my absolute fave. I spend hours on it. 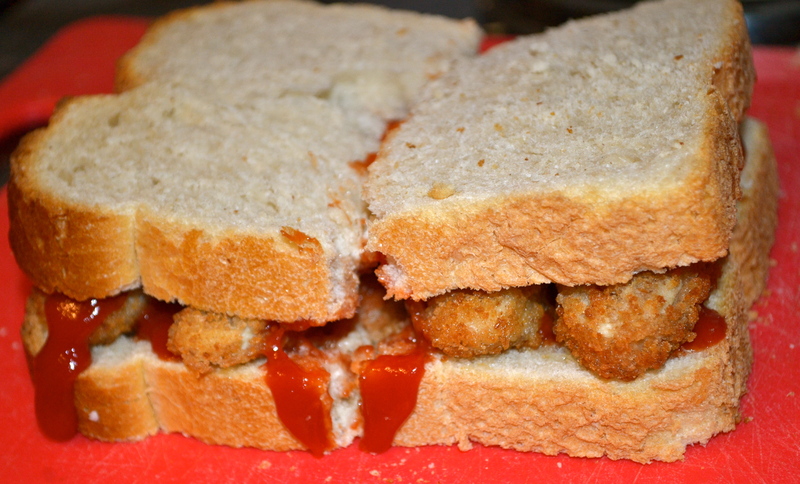 So, I have decided to bring that love over here, and, each Friday, give a weekly roundup of all my poncy food photos, ok? 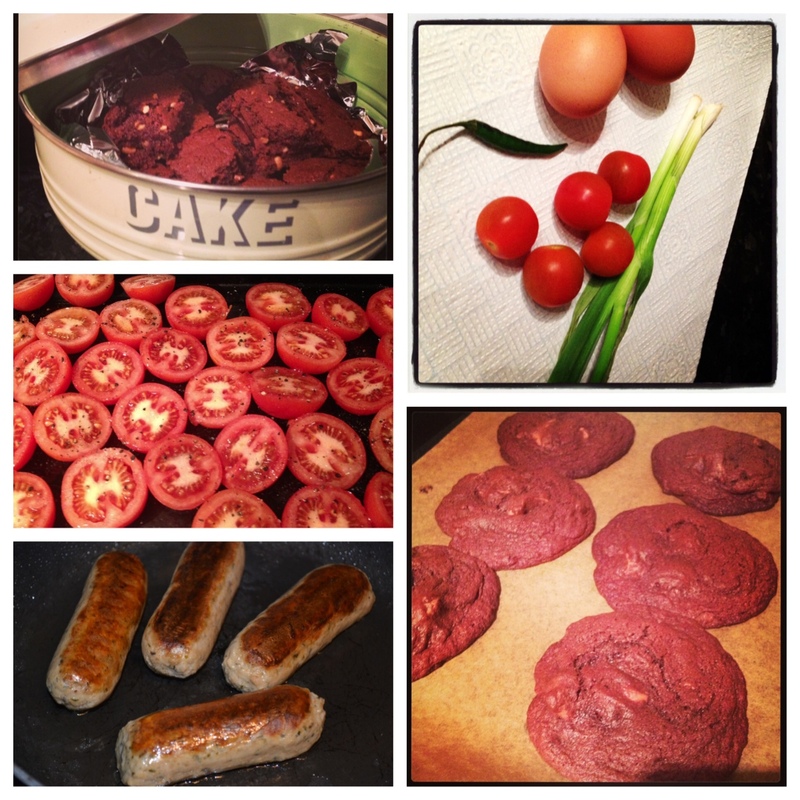 Brownies; heuvos mexicana ingredients; tomatoes for tomato soup; chocolate cookies; veggie sausage tasting. 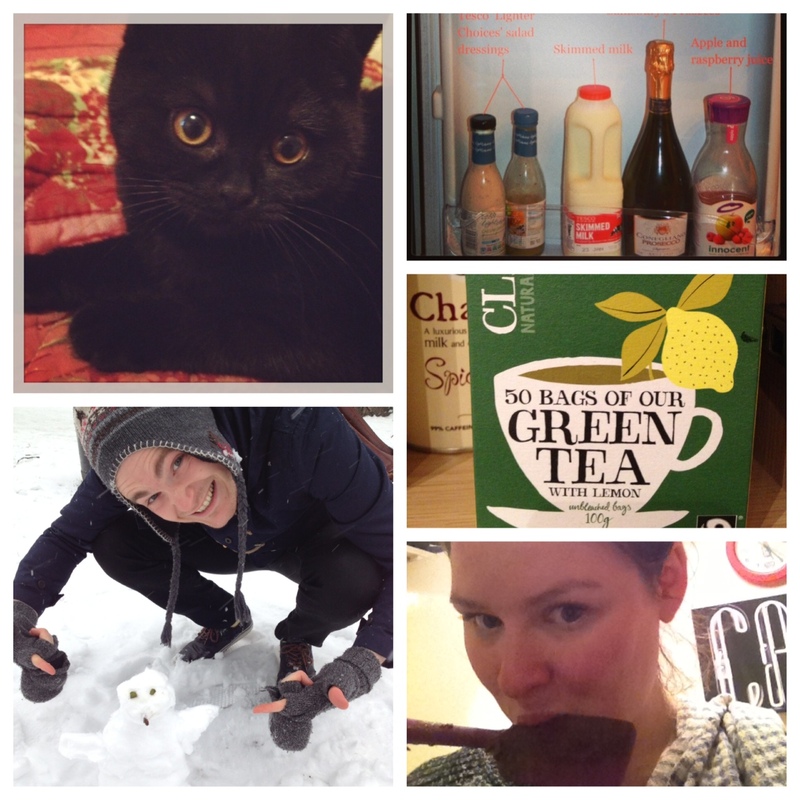 D.C; fridge photos; snow is Russell Square; green tea; licking the spoon. Any of you on Instagram? Let me know your usernames, so that I can follow you! I am, obviously, @pyandplate. 1. Baking books, great for cakes and cookies, but not so hot for the ‘What should I make for dinner on this grey Tuesday with the half cabbage and off cuts of cheese in my fridge?’ debacle. 2. Ancient, foisty old tomes picked up at charity shops, bought out of curiosity and mocked for their datedness. 3. Books that I devour as though they were novels. 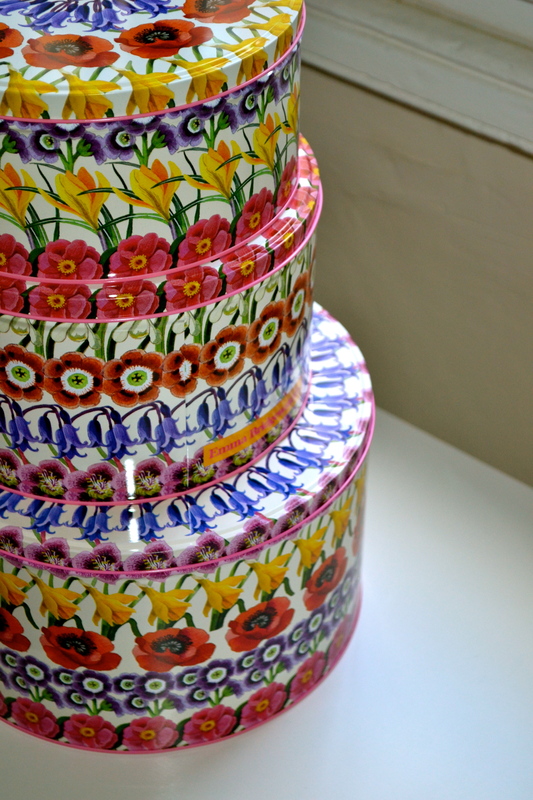 The Nigella How to Eat and the Nigel Slater Real Food type of thing. Full of inspiration and interest, but somewhat lacking in the ‘recipes for the non-meat eater’ department. From these three arenas I develop my ideas and recipes, blending, borrowing and bending. 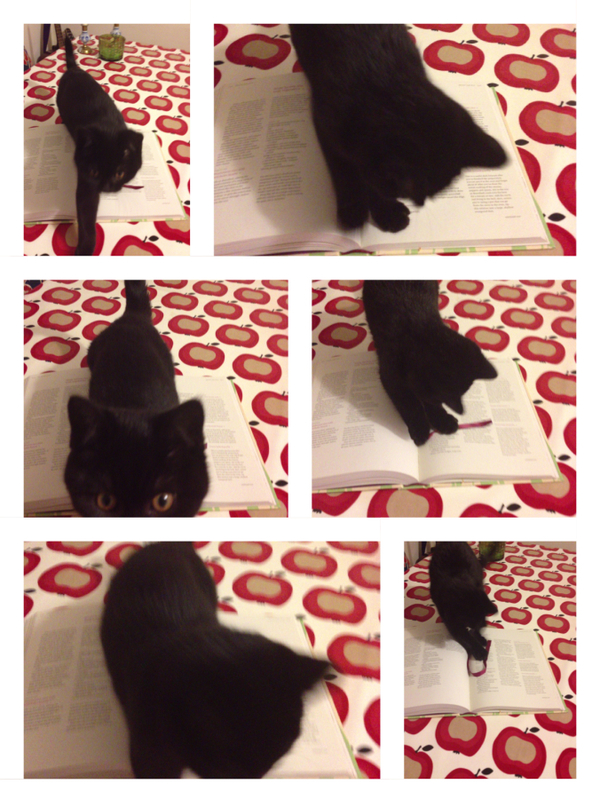 However, none of my books help in a perfectly direct way. None simply tell me what I should make when I am pushed for time and/or inspiration. 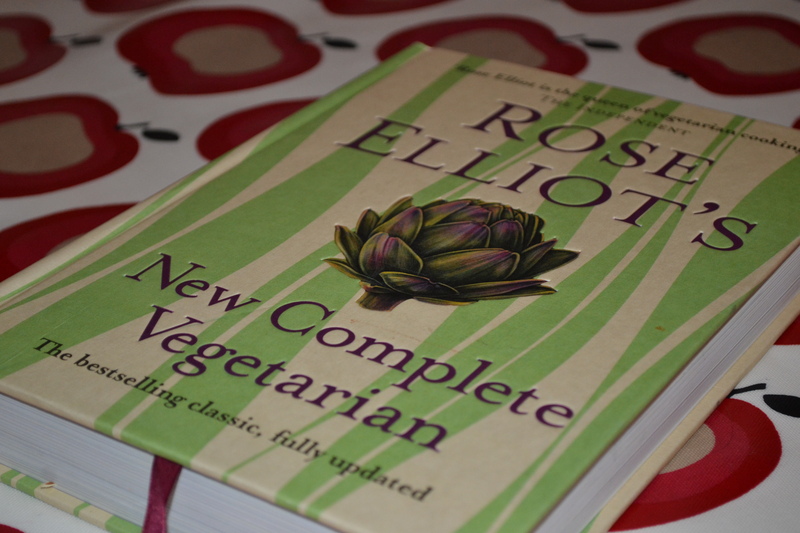 Feeling as though I could do with a bit more of a helping hand some nights, I invested in Rose Elliot’s New Complete Vegetarian. Now, this is the first cookbook that I have ever owned whose sole purpose is to provide everyday recipes for vegetarians (I do own the amazing Veggiestan, which I use often, but I’m not counting that as it is centered around being food from the Middle East with only secondary emphasis on lack of meat). There is something completely and utterly freeing knowing that I can open the book and eat the suggested meal with no tinkering at all. So that is what I did: the book flipped open to Paella. Normally the reserve of fish-eaters, I had not eaten a paella since around 1998, aged 10 in the windiest restaurant in Spain. 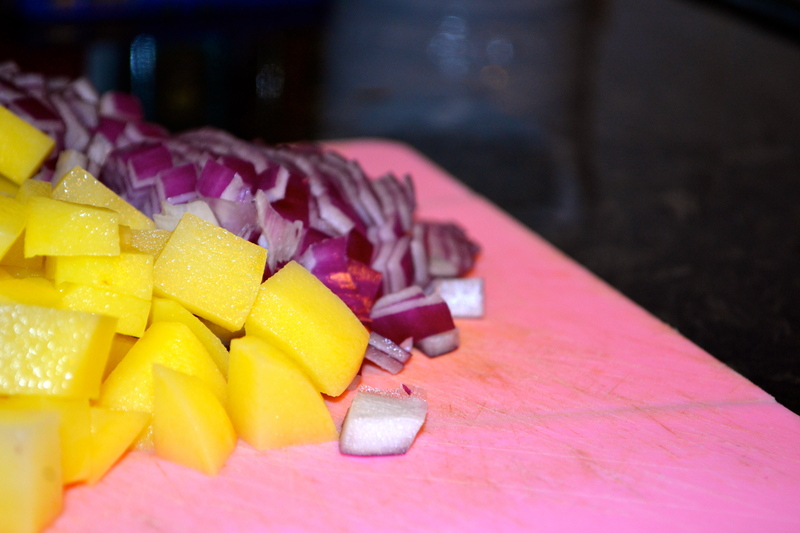 I was pleasantly surprised by the veggie result; tasty, interesting and now a regular in my kitchen. Just like that. 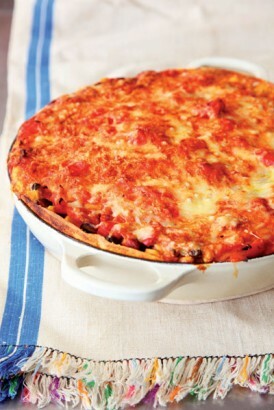 The same can be said of all the dishes I have tried out of the book; not a dud in sight. That’s the thing with this book: it is packed full to brim with tasty, simple, quick veggie dishes. Just what I needed. Now, this book may not get your heart racing. There are next-to-no glossy, stylized photos. There are few recipes that would win rounds of exclamations from a round table of Michelin starred chefs. If you have been cooking for years, do it almost professionally and think that homemade tortellini and ragu is a simple mid-week meal, then this book isn’t for you. But, for the rest of us, this is the perfect book for any veggie, be you newbie or oldie. What this book lacks in inspiration and excitement it more than makes up for with its ease, from sourcing the required ingredients to the cooking itself. I can’t really recommend this book highly enough as a veggie staple on the cooking book shelf. Even my kitten loves this book! Which cookery books do you swear by? 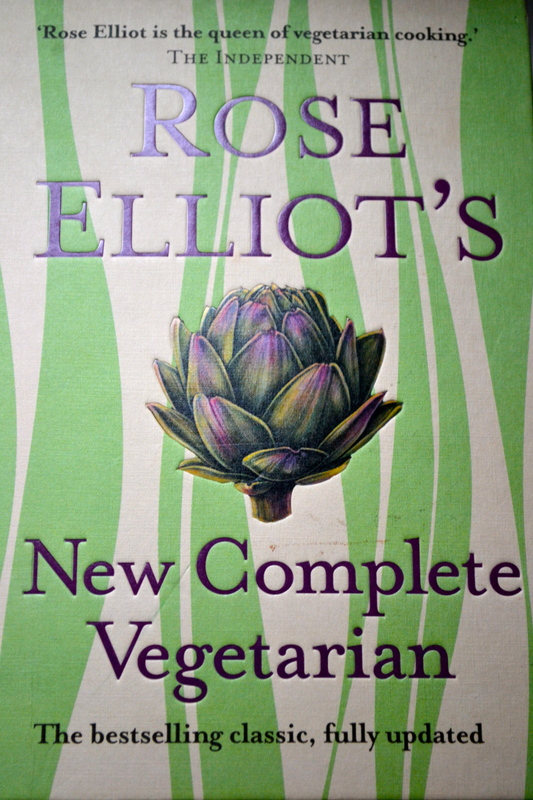 Tried Rose Eliot’s New Complete Vegetarian? Any recipe recommendations from it? 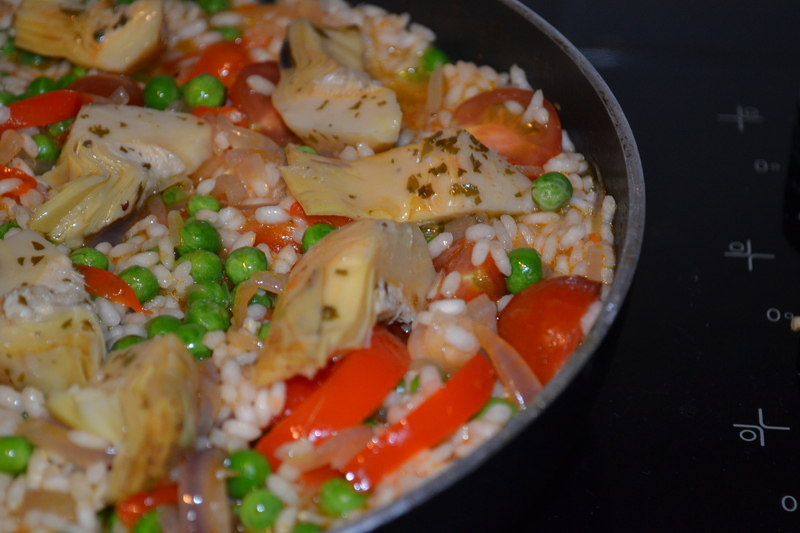 P.S The paella featured in this post was actually made for me by Mr Py; another benefit of this recipe book is that he too enjoys using it! Do you get sick of being thwarted by bacon? You are checking out a recipe and all seems good, but a quick look down the list of ingredients suggests that bacon is a requirement. Bugger. Except that I have a brilliant solution. At least, that is, if there is also cheese in the recipe. If what you seek is indeed a cheesy treat (invariably, for me, it is), then why not try swapping the suggested bacon and cheese combo for a smoked cheese? This brings with it its own salty, smokey, barbecue-y flavour, perfectly mimicking the ousted bacon. 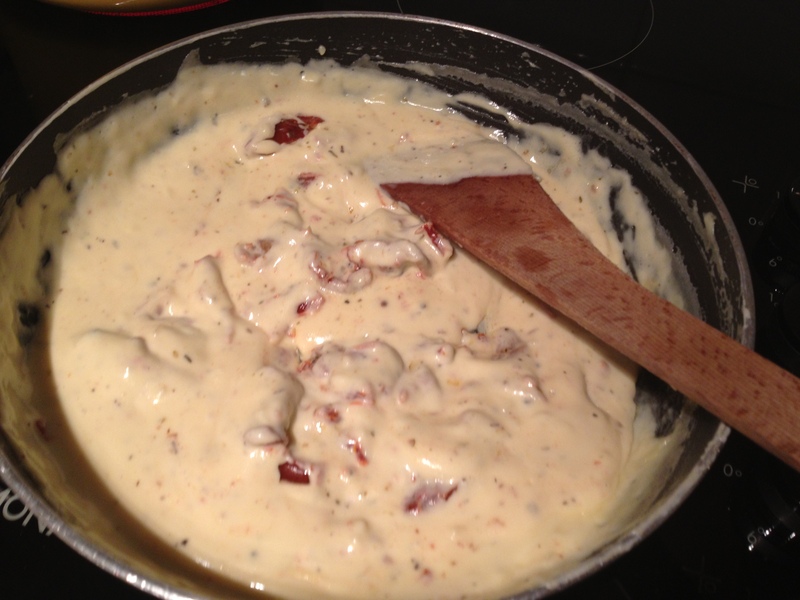 For instance, when I fancy a carbonara (as I do tonight), I make my sauce by mixing cream, mascarpone, egg and smoked Applewood Cheddar (plus some pepper and nutmeg). To add some texture, I might mix through some sun-dried tomatoes or some mushrooms. Delicious. Creamy, smokey carbonara. Don’t mind if I do. What are your go-to bacon replacements? Does smoked cheese rock your world too?